According to Golden State Warriors coach Mark Jackson, New York Knicks superfan texted the former Knick point guard over the weekend for his supposed role in gifting Jeremy Lin to the Knicks last December. Lin spent his rookie season with Golden State in 2010-11 before being cut from the Warrior training camp on its first day earlier this winter. He was then cut from Houston Rockets camp and nearly from the Knicks a week and a half ago before taking his star turn last week. 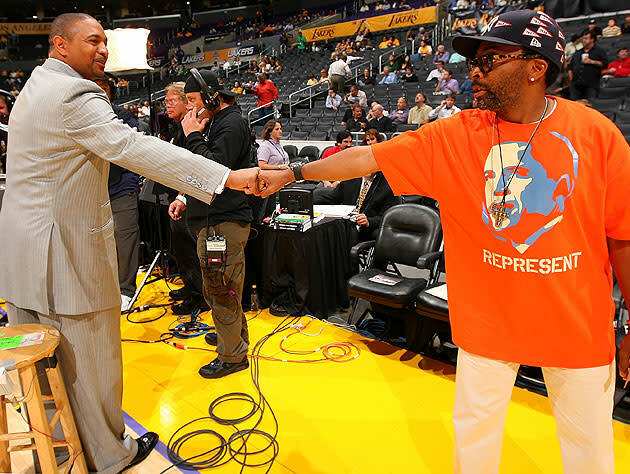 "I got a text message from Spike Lee this morning," Jackson said after Warriors' practice on Saturday. "I had nothing to do with Jeremy Lin. I never saw him do a layup. So for the people … stop asking me. He never practiced for us so leave me out of it." There are quite a few ways to go with this. Mark Jackson is not the Golden State Warriors' personnel chief, so it isn't as if he has the first or final say on who stays and who goes. But everyone knew the lockout-shortened training camp would result in a litany of pulled hamstrings and tired legs. Why not leave the camp roster as big as deserves while you work through that rough start? Especially with guard Stephen Curry's ankle bothering him? Secondly, how do you cut a guy before even rolling the balls out? So you weren't impressed with Lin on paper? Fine. And you may not have seen anything in practice to convince you to keep the kid? That's OK, too. But in your first week as an NBA head coach, don't you at least want to see what hand you've been dealt in its entirety? This looks like piling on. This makes Jackson look the villain for cutting the NBA's hottest thing without even giving him a chance to make a layup. Don't forget that Lin was only mildly impressive last season in his rookie year, and that the Rockets (with one of the best GMs in the business running the show in Daryl Morey) cut Lin soon after. We don't want to make things out to be too severe, and too black and white -- but not a single layup? Even if you're not the one doing the cutting, shouldn't the coach get to see as much? We're not Ed Weiland, who noted that the stats behind Lin's turn at Harvard showed the same statistical hallmarks as some of the NBA's most athletic point men. We're not going to tell you that we saw Jeremy Lin's ascension coming, or that the Warriors and Rockets were dopes for how they handled him. But we did see him play brilliantly in the 2010 summer leagues, showcasing athleticism and an ability to take chances. And if you would have told us back in December that Jeremy Lin would take advantage of a schedule against the Nets, Utah Jazz (with that terrible defensive frontcourt), the awful Washington Wizards, the Lakers playing on the wrong end of a back-to-back (coming off an overtime win, no less), and the Timberwolves on his way to a week's worth of All-Star level stats? That wouldn't surprise us. He looked that good in 2010. There really are no surprises in this league, which is why you have to give yourself the chance to be surprised. Don't be too dismissive of what really was a perfect confluence of events for Lin last week, but don't stop yourself from marveling at the guy's play in the win over the Lakers on Friday; 38 points is 38 points. And, as Will Leitch astutely pointed out, don't be afraid to be smitten. We heard Mark Jackson say "KYP" ("Know your personnel") too many times over his time spent with ABC/ESPN to let him run free on this one, though. Hindsight is 20/20, but when you aren't even given (or give yourself) the chance to spy the guy? It was nearly 25 years ago that Jackson was a young point guard that many dismissed without seeing him play a lick of NBA ball. If he's telling the truth about not seeing Jeremy Lin shoot a layup before the Warriors cut him, then this is a bit of a bummer. It's also a chance to learn. These guys are out there. Listen to Ed Weiland. Question yourself. Have a memory that might include one spin move and finish in traffic during an exhibition game from July of 2010. Take chances. Knicks coach Mike D'Antoni isn't immune from these lessons, either. It took until just a few days before Lin's eventual Knick release and a month and a half of awful Knicks point guard play to give him an extended chance with New York. It's a goofy game, and a goofy league that we'll never fully understand. The minute we forget this, is the minute we cut someone like Jeremy Lin without even watching him practice.